Use Case:- System administrator want to assign Permission Sets to 20 users due to a business requirement. 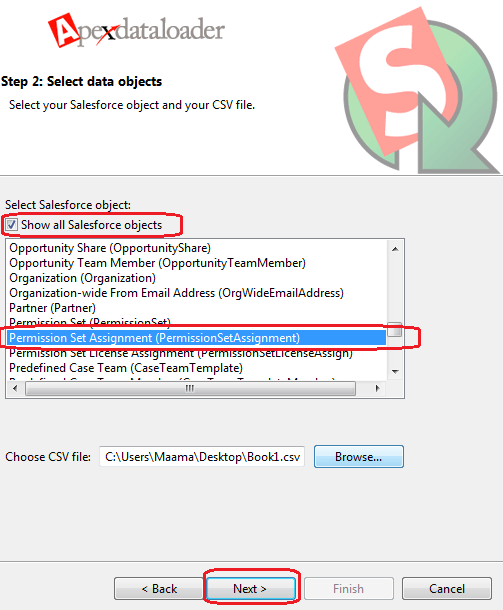 4) First select check box ” Show all Salesforce objects”, then select “Permission Set Assignment” object and browse the .csv file that we created in step 1. Once done click on Next. Note :- If you are unable to find this object in Data Loader, update your data loader by following this step Setup | Administration Setup | Data Management | Data Loader. Download Data Loader and install it. 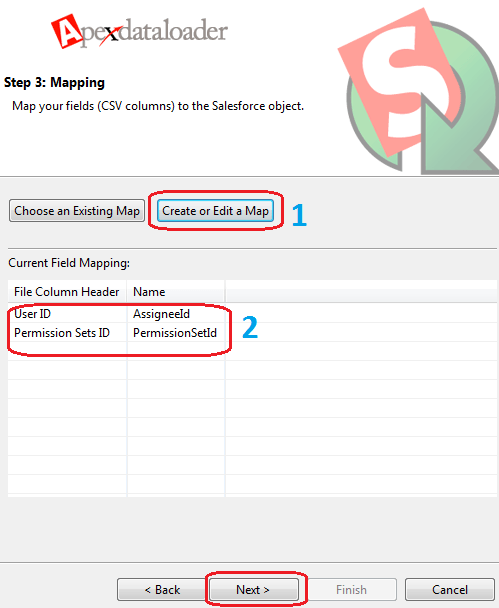 5) Map the fields User ID to “AssignedID” and Permission Sets ID to “PermissionSetId” as shown in below screen shot. 6) Click on Next, Select location for Error and Success report and click on Finish to complete this process. After Spring’14 release it’s very easy job for you. 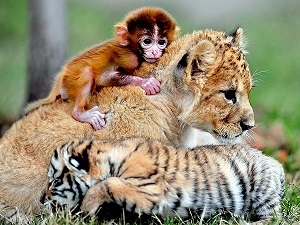 Any one can assign permission sets to multiple users. 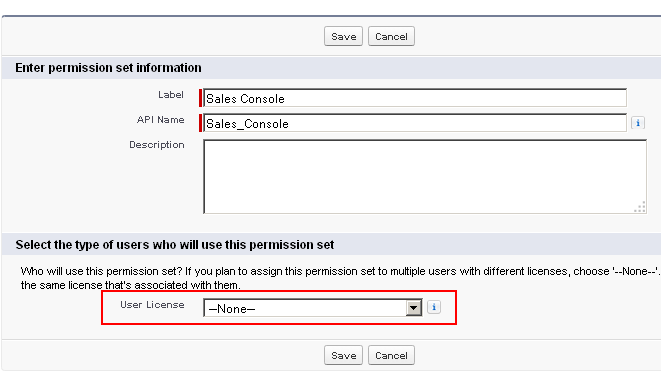 From any permission set page, you can assign the permission set to one or more users. This feature available in Developer, Performance, Enterprise, Professional, Contact Manager, Group, Unlimited and Database.com editions. All you need is “Manage Users” permission. 1) Click on Name | Setup | Administration Setup | Manage Users | Permission Sets. 2) Select a Permission Set that you want to assign and drill down to the it’s details page. 3) In the permission set toolbar, click on “Manage Assignments” button, It will redirect you to a new page. 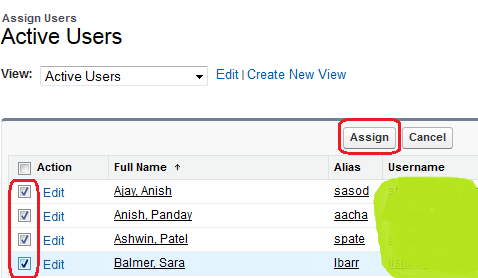 4) Click on “Add Assignment” and select the users to assign to this permission set, Once done with Selection Click on “Assign“. Note:- You can assign a permission set up to 1000 users at a time. 5) Review the messages on the Assignment Summary page. If any users weren’t assigned, the Message column lists the reasons. 6) To return to a list of all users assigned to the permission set, click Done. 2) Select a Permission Set that you want to remove from user and drill down to the it’s details page. 4) Now Select the users to remove from this permission sets, Once done with selection click on “Remove Assignments” (This button is only available when one or more users are selected). 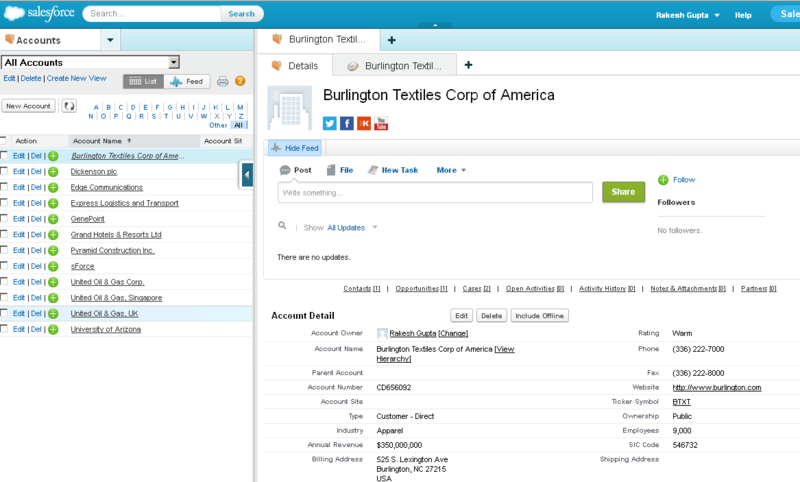 Salesforce will pop-up a message and ask for your confirmation. Note:- You can remove up to 1000 users at a time. 5) To return to a list of all users assigned to the permission set, click Done.